Decorating OCD, that's what I have diagnosed myself with. Remember here when I made a chandelier out of a basket? Well, I liked it but it bothered me because it was just decorative. We don't have any electrical up in the ceiling for a chandelier, and I wasn't about to ask my husband to do yet another project. And, I like things to be functional. at TJ Maxx for $49, I knew it was meant to be. cozy dinners with the family. The same day I got the lantern, I went over to World Market to see what was new. I picked up this cup holder. I bought it thinking it would be great in my master bath to hold jewelry. But when I plopped it on the dining table when I got home, I knew it had to stay. 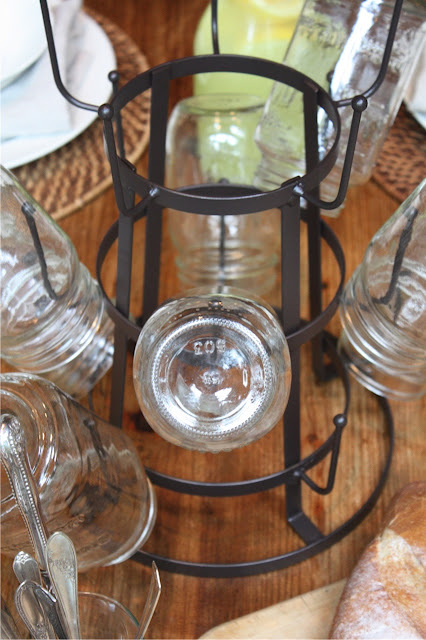 I filled it with mason jars which we use for drinking glasses. Best part, it was $14.99! Yes, it's not the real deal, but I have the real deal in my kitchen! The size is just right too. 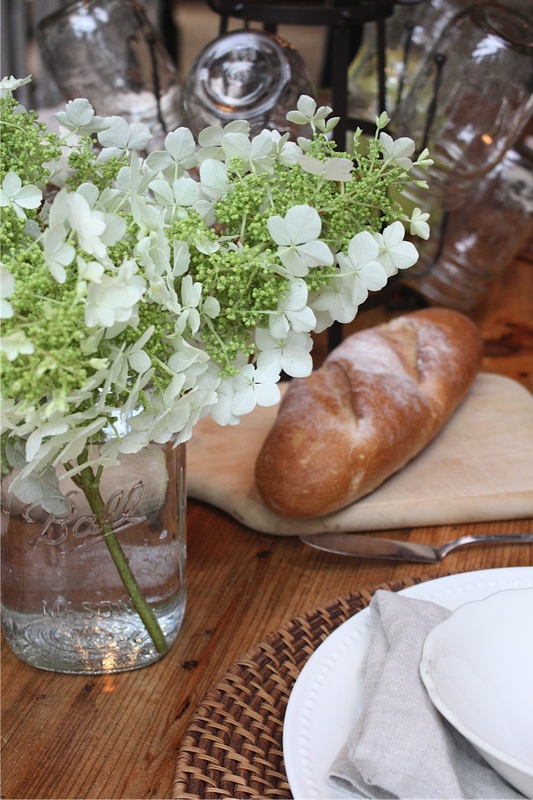 These new things prompted me to set the table for dinner using rustic neutral elements. really simple and I like the bit of green. I love how this room makes you feel like you are up in a tree house amongst the green trees outside. not missing any view of the lake outside the windows! Here is the view looking into the kitchen. And looking into the living room. The chargers are from Target. Bowls are vintage ironstone and the plates are dollar store. 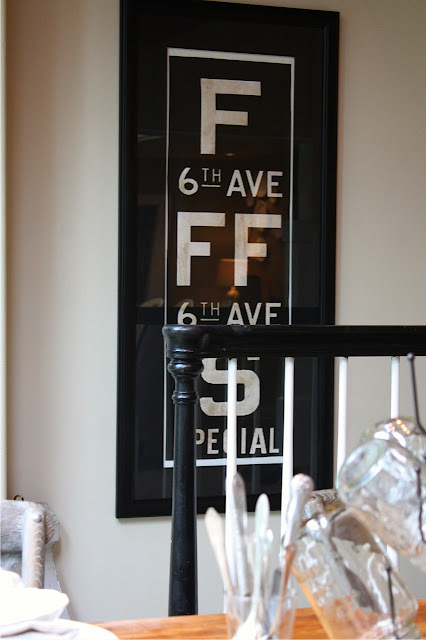 Remember my DIY knock off Restoration Hardware subway art? I love the look of the crumpled linen napkins. 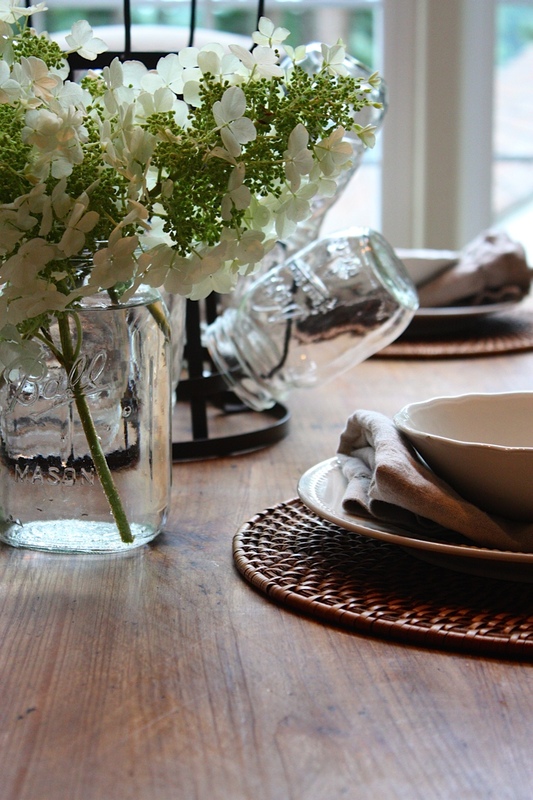 It gives the table a casual feel, and speaks true to who we are. We are not formal people folks! The new lantern or the old basket? Please say the new lantern!!! I think it's important for you to know that I drool over pictures of your home the way you drool over pictures of other peoples' homes :) So beautiful! 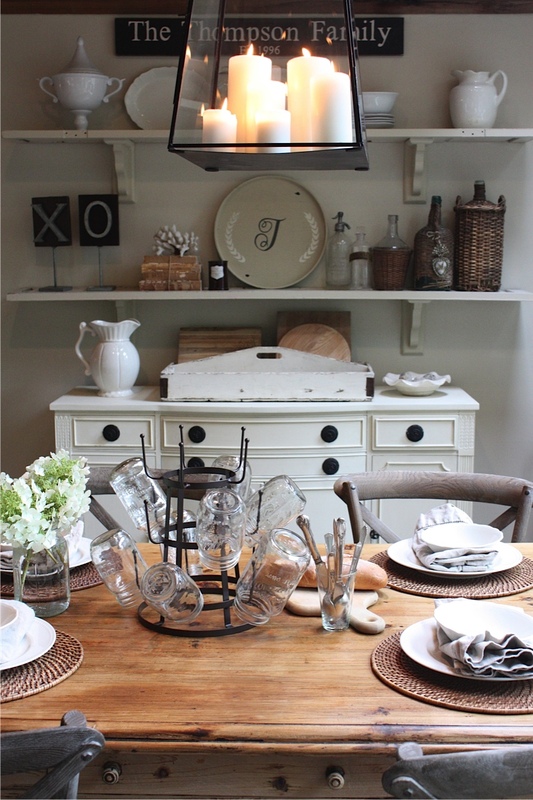 I love the lantern over the table. Candlelight is always so much warmer and inviting that incandescent light. I was wondering something. I love the cup holder on the table. We don't have World Market in my area. (Just another reason to miss Seattle!) I was on their website looking for it and cannot find it. Could you tell me the name or description or whatever that was on the tag? Thanks! 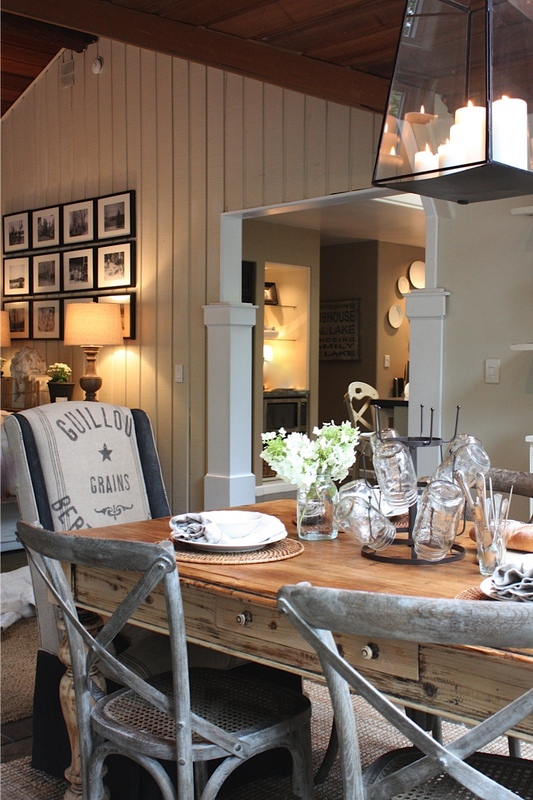 Any time you show pictures of your dining room, I start pinning!! 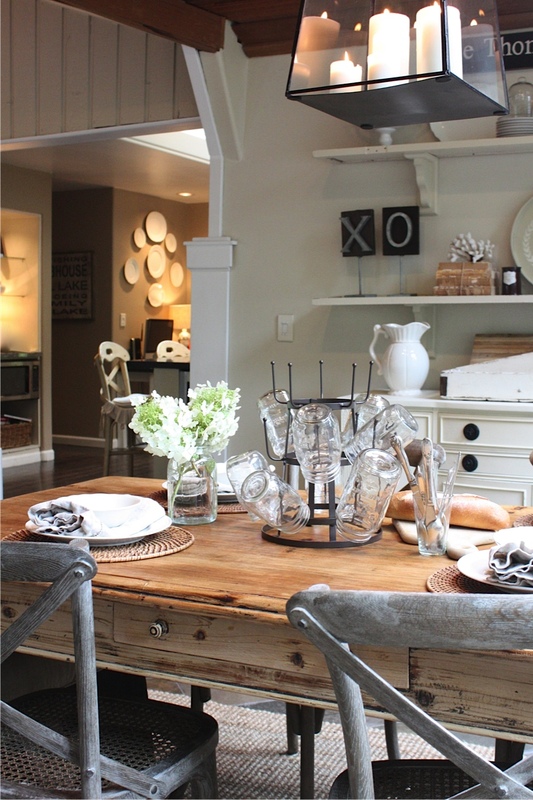 I just love, love, love, your dining room. It is so unique and so beautiful!! Gorgeous room! I also saw that cup holder at World Market just the other day. I remember your "real one" from the post you did. I have little to no counter space so I put it back not thinking of anything else to use it for. You just gave me an idea. 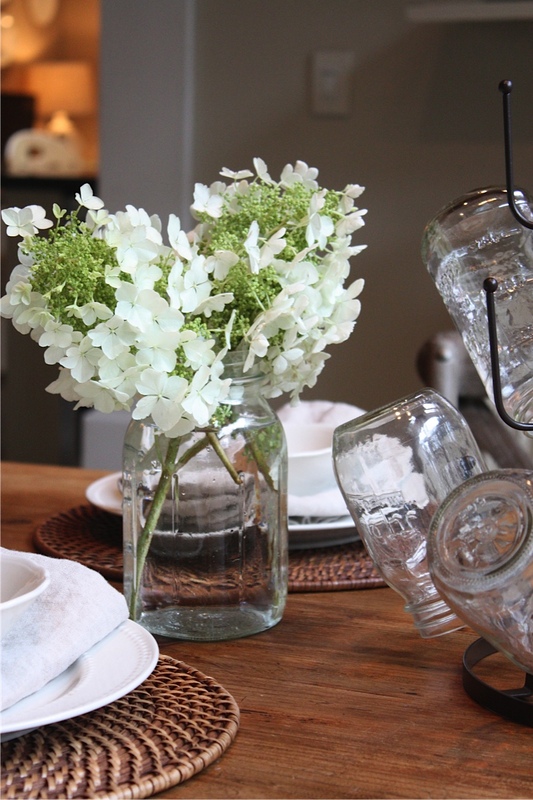 Mason jars are huge right now....thanks for sharing! Oh by the way, I love both the basket and the lantern....it would be hard to decide for me. And your wicker placemats are cool being used as chargers. Beautiful home! I vote for the lantern. I love the candlelight look with the trees as a backdrop! Girrrrl, you gotta stop making me spend money. Now i gotta go find one of those cup holders. $14.99?, Oh, that's a G.O.T. T.O. H.A.V.E. item. love it! totally awesome use of the lantern. and I loved the basket too, even if it didn't light. the candles will be so cozy. I miss my candle chandelier :( I broke down and went electric when we had work done to an adjoining room. Definitely the lantern! Nothing better than candles to make everything beautiful. I have those same Dollar Store plates, aren't they great :) I was just at World Market but must have missed that holder, 14.99 is a an amazing price for that even if it isn't the real deal. I might have to go back for one now! the lantern takes the trophy home! beautiful shots.....the cup holder is amazing...gotta make a trip to World market in ATL. I love your new lantern. How romantic. As for the drying rack. I saw those as well and really wanted one. I wasn't sure what I'd do with it but i'm thinking terra cotta pots filled with goodies for Halloween. I just have to grab one before they are gone! Wow - that looks seriously amazing! Definitely keep the lantern! I love how you are constantly rearranging your home. Using simple and elegant pieces. And I especially love the ones you create yourself. Always drool over the eye candy you share with us. Your home and creations are awesome. I have been a huge fan of your blog for over a year now. I've purchased from your Etsy shop and adore my pieces and the quality of your craftmanship (craftwomanship). Keep the lantern, candles say cozy and homey, it doesn't interfere with your beautiful view. I also purchased that mug tree/holder from World Market, we are big drinker from Mason Jar's, my boys just love it! i LOVE the lantern. girl. you are amazing. Love the way you decorate. It's gorgeous! Great finds. Love the lantern !! I just picked up the cup rack too. It was the last one they had !! Yipee!!! I really liked the basket, but I love your lantern! Great idea. I love the table! Can you tell me where you bought your table? I love everything! Your dining area looks like it came out of a magazine, it's so beautiful, and that lantern is gorgeous above your table. I think will be heading out to world market tomorrow for that cup holder. 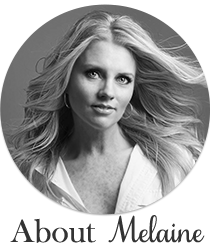 Love the photos of your gorgeous room and the new lantern, Melaine. 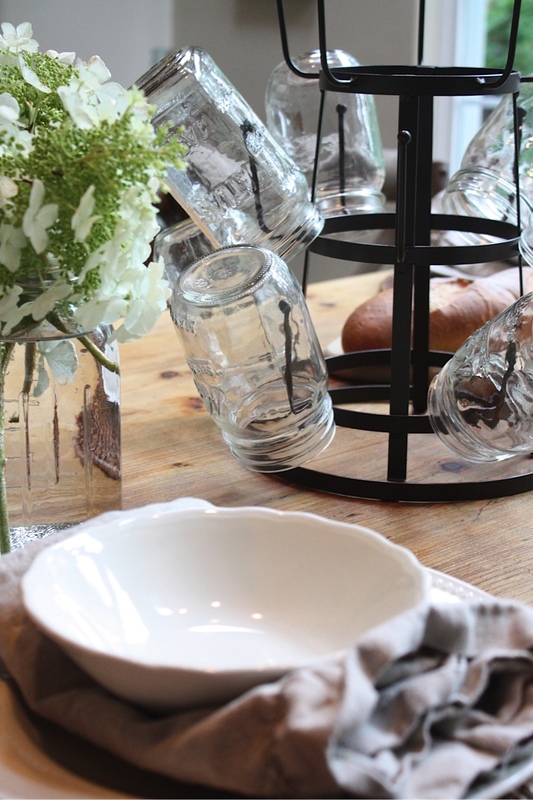 The jar holder is a great piece and I love the relaxed rustic tablescape. So inspiring! Did you paint your wall darker in the kitchen? It looks warm and cozy! It's all so pretty! Love the metal cup holder...perfect! Can you publish your wall colors in the rooms pictured? I really love them!! 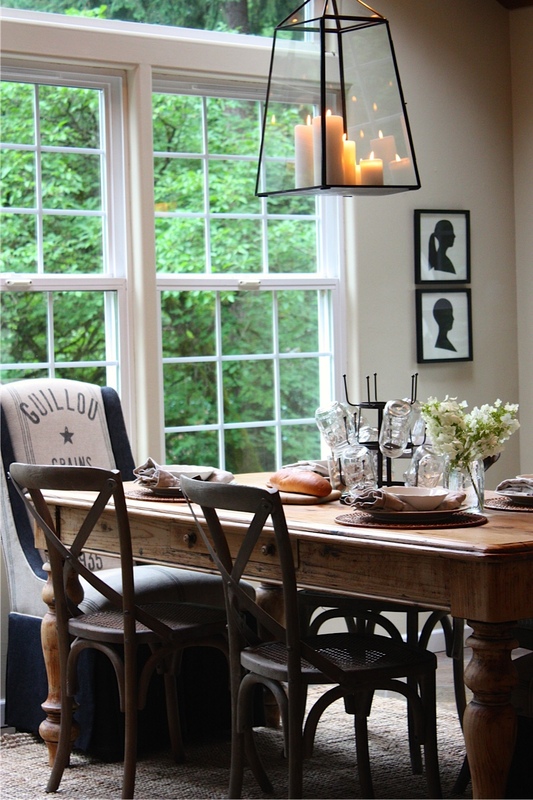 Lanter looks gorgeous and it adds a romantic scenery in your dining..Love it! I just love the lantern it looks beautiful. The whole space is wonderful. I am so glad you didn't paint the table I visit often and I just love it. I wish I had a World Market near me. The cup holder is great. I love the design of the lantern. Very creative design which goes with the rest of the kitchen. LOVE the lantern..so cozy! Just went to WM and pick up the last cup holder..thanks for the tip! 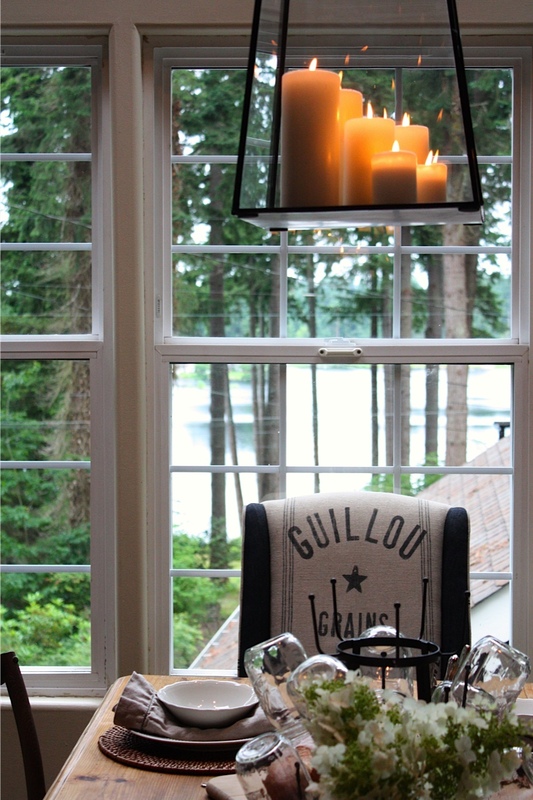 Love the lantern, the tablescape, and the view! I say the new lantern! Looks fantastic and the cup holder is fab! We don't have a World Market here, would love to shop there though! I love it all! The lantern is perfect! I want to come sit in your kitchen and have a cup of coffee. So inviting!! 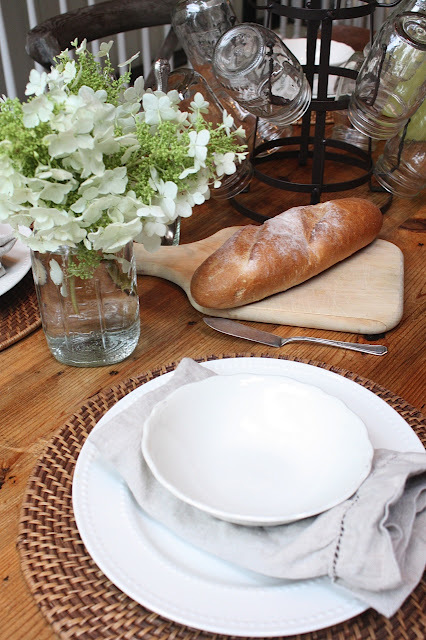 Where is your dining table from??? Another plea for more info on the World Market cup holder! It's fab and we don't have a store around here but by daughter has one in her town in California and maybe could get me one. I couldn't find it on their website, though I looked in many categories and searched using the keyword "cupholder" ... any info will be much appreciated! Definitely like the new lantern better! Your style is beautiful and inspiring. 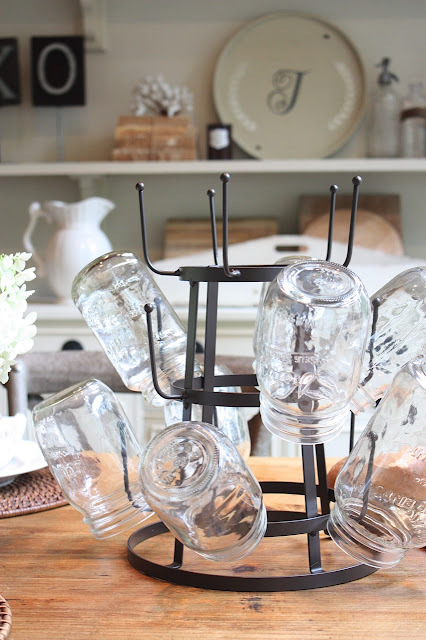 I poured over the World Market web site, but cannot for the life of me find the bottle rack? Any idea of what is it called in the store or UPC numbers on your receipt? Thanks a bunch. Love your dining room, and the lantern looks lovely! I was wondering where you got your cane-seat chairs from...they look great!